It must be Holy Grail month. 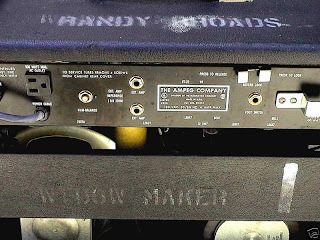 Here's a listing for a Randy Rhoads owned Ampeg amplifier (Item #: 160368068935). 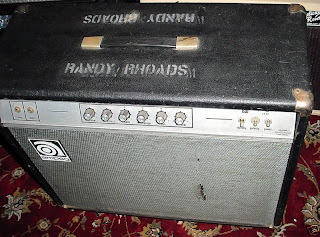 Randy used this amp on the first Blizzard of Ozz tour in Europe. The seller is Bob Rissi, who is himself a notable figure in amplifier design. Rissi joined Fender in 1961, and first worked in its quality control and inspection department. In 1964 he joined Fender's R&D department as an amp designer, working on the company's solid-state line of amplifiers. Solid-state was just starting out and Fender was hoping to jump on that bandwagon, considering that solid-state amps would be far cheaper to produce and prove more reliable than tubes. This new line of amplifers were poorly received and were plagued with electronic problems. Given names like Solid State Bassman, Solid State Deluxe Reverb and Solid State Twin Reverb, they mirrored Fender's classic tube amps in name but not in tone. In an attempt to make these amps more 'versatile', also included was a 'Style' switch for the user to select between 'Pop', 'Normal' and 'CW/RR' (presumably 'Country Western/Rock n' Roll' tones). Rissi himself has stated that these amps were problematic because of a lack of solid-state component manufacturing expertise at Fender at the time. After leaving Fender in 1967 he joined Rickenbacker, designing their Transonic line of ampllifiers before starting his own Risson Amplifier Company in 1970. Risson produced both solid-state and tube amplifier lines. "I, being a Randy Rhoads fan, purchased it for myself when Jet Records offered it in trade on Risson LTA Stacks for Steve Kara of The Electric Prunes Band shortly after Randy Rhoads death. Jet Records was then owned By Sharon Osbourne's Dad. Jet Records Represented many top groups of that era. I put it in storage some 20 plus years ago with all my other amplifier components when I closed down Risson Amplifiers and went into the Computer Consulting business. It was working perfectly when traded in and I did not use or even clean it, so as to save it as used by Randy Rhoads. I got so involved with computers over the years, that I forgot I had this amp. I am now again, building amplifiers and found this and some other items I will also be selling. It is a real shame it has just been sitting for so long. It should be played and appreaciated for its history. I am an Amplifier Engineer and do not really play. So I decided to sell to someone who could enjoy its sound and history. It has already contributed so much to the music scene. Jet Records stated in the accompanying letter that prior to Randy using it in rehearsal and on stage in Ozzy's Band in Europe, it was used on tours of Ariel Bender and Widowmaker."